Palestinians have so loudly and for so long (nearly a century) rejected Zionism that Mufti Haj Amin al-Husseini, Yasir Arafat, and Hamas may appear to command unanimous Palestinian support. But no: polling research finds that a substantial minority of Palestinians, about 20 percent, is ready to live side-by-side with a sovereign Jewish state. Although this minority has never been in charge and its voice has always been buried under rejectionist bluster, Hillel Cohen of the Hebrew University of Jerusalem has uncovered its surprisingly crucial role in history. 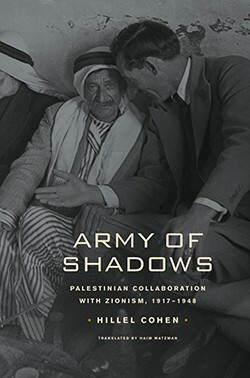 He explores this subject in the pre-state period in Army of Shadows: Palestinian Collaboration with Zionism, 1917–1948 (translated by Haim Watzman, University of California Press); then, the same author, translator, and press are currently preparing a sequel, Good Arabs: The Israeli Security Agencies and the Israeli Arabs, 1948–1967, for publication in 2010. In Army of Shadows, Cohen demonstrates the many roles that accommodating Palestinians played for the Yishuv, the pre-state Jewish community in the Holy Land. They provided labor, engaged in commerce, sold land, sold arms, handed over state assets, provided intelligence about enemy forces, spread rumors and dissension, convinced fellow Palestinians to surrender, fought the Yishuv's enemies, and even operated behind enemy lines. So great was their cumulative assistance, one wonders if the State of Israel could have come into existence without their contribution. The mufti's absolute rejection of Zionism was intended to solidify the Palestinian population but had the opposite effect. The Husseini clique's selfishness, extremism and brutality undermined solidarity: using venomous language and murderous tactics, declaring jihad against anyone who disobeyed the mufti, and deeming more than half the Palestinian population "traitors" pushed many fence-sitters and whole communities (notably the Druse) over to the Zionist side. Consequently, Cohen writes, "As time passed, a growing number of Arabs were willing to turn their backs on the [rejectionists] and offer direct assistance to the British or Zionists." He calls collaboration with Zionism "not only common but a central feature of Palestinian society and politics." No one before Cohen has understood the historical record this way. He discerns a wide range of motives on the part of the Yishuv's Palestinian allies: economic gain, class or tribal interests, nationalist ambitions, fear or hatred of the Husseini faction, personal ethics, neighborliness, or individual friendships. Against those who would call these individuals "collaborators" or even "traitors," he argues that they actually understood the situation more astutely than Husseini and the rejectionists: accommodationists presciently realized that the Zionist project was too strong to resist and that attempting to do so would lead to destruction and exile, so they made peace with it. By 1941 the intelligence machinery had developed sophisticated methods that sought to utilize every contact with Palestinians for information gathering purposes. Army of Shadows highlights that the Yishuv's advanced social development; what Cohen terms the "deep intelligence penetration of Palestinian Arab society" was a one-way process – Palestinians lacked the means to reciprocate and penetrate Jewish life. Along with the development of a military force (the Haganah), a modern economic infrastructure, and a democratic polity, this infiltration of Palestinian life ranks as one of Zionism's signal achievements. It meant that while the Zionists could unify and go on the offensive, "Palestinian society was preoccupied with internal battles and was unable to mobilize and unify behind a leadership." Cohen is modest about the implications of his research, specifically arguing that Palestinian assistance was not "the main cause" of the Arab defeat in 1948-49. Fair enough, but the evidence he produces reveals the crucial role of this assistance to the success of the Zionist enterprise in the period of his first volume. Interestingly, while that assistance remains important to the Israel Defense Forces today (how else could the IDF foil so many West Bank terrorist attempts? ), the State of Israel deploys far greater resources than the Yishuv, making Palestinian assistance much less central today. Cohen also confirms the key fact that not all Palestinians are the enemies of Israel – something I have documented for more recent times. This offers cause for hope; indeed, were the 20 percent of Palestinians who accept Israel expanded to 60 percent, the Arab-Israeli conflict would close down. Such a Palestinian change of heart – and not more "painful concessions" by Israel – should be the goal of every would-be peacemaker. Mar. 26, 2009 update: This article adds a historical dimension to a topic I have been following for the past fifteen years. For a listing of these, see "Bibliography – My Writings on Arabs Appreciating Israel." And for an unexpected confirmation of the 20 percent figure, see "Canada's Pro-Israel Muslims." Related Topics: Arab-Israel conflict & diplomacy, History, Palestinians | Daniel Pipes receive the latest by email: subscribe to the free mef mailing list This text may be reposted or forwarded so long as it is presented as an integral whole with complete and accurate information provided about its author, date, place of publication, and original URL.